Değerli dostumuz Ed Glaser, bu hafta vizyona girecek olan Muhteşem Yedililer (Yedi Silahşörler) filminin şerefine Türk işi Muhteşem Yedileri‘miz veya Yedi Silahşörlerimiz de diyebileceğimiz Yedi Belalılar üzerine bir video hazırlamış. Istanbul’da bulunduğu dönemde İrfan Atasoy ile görüşmelerinde yanında bulunduğumuz Ed Glaser film incelemesini yaptığı ve analizlerini kısa ve öz derlediği Neon Harbor’un yeni videosunu sizlerle paylaşıyoruz. In 2016 the Magnificent Seven ride again. In fact they’ve been riding off and on for over 50 years, righting wrongs from the U.S. to Mexico, and from the Wild West… to the Middle East. So saddle up for this maybe-magnificent episode of Deja View. John Sturges’s 1960 “The Magnificent Seven” is already an international remake, of course. It’s a gunslinger version of Akira Kurosawa’s “Seven Samurai.” A hit in dozens of countries, “Magnificent Seven” was successful enough to justify three sequels and a TV series. Its story of tough guys banding together to protect poor, honest men and women from predatory bandits is universal. It’s been remade time and again by film industries all over the world: with Russian dwarves and cartoon bugs, in ancient Rome and outer space. But the Turkish version doesn’t stray quite so far from home. 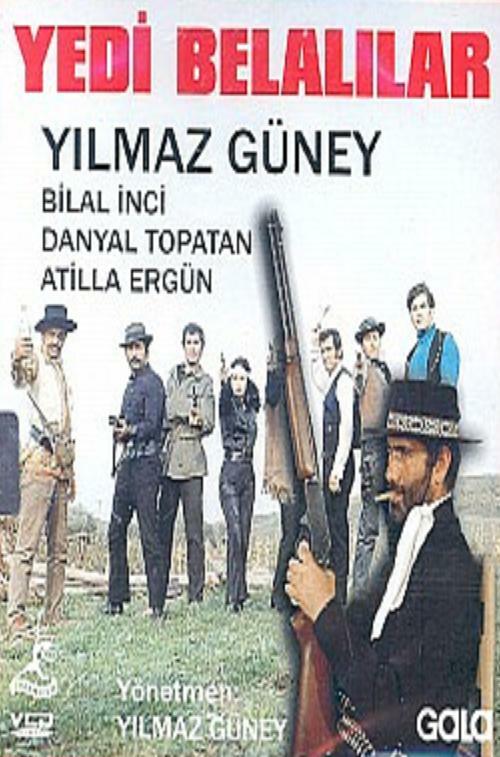 “Yedi Belalılar,” literally “Seven Troublemakers,” merely transplants the action from the Wild West to wild Anatolia—without much difference in scenery. The naturally barren landscape looks much like the Spanish and Italian countrysides that had been doubling for the American Southwest in Spaghetti Westerns. And in fact it was the Italian Western, and not the American brand, that had captured cinemagoers’ imaginations in Turkey. And at the same time, Wild West comics from Europe like “Lucky Luke,” “Captain Miki,” and “Zagor” were flying off newsstands. Add to that Turkey’s ravenous appetite for adventure cinema, and locally-made Westerns were virtually inevitable. By the ‘70s the Turkish film industry was producing up to 15 “kebab Westerns” per year. And although some of these featured original characters, many revolved around familiar names. Turkish filmmakers adapted The Lone Ranger, Zorro, Django, and several of the popular European comics. So a Turkish “Magnificent Seven” fit right in. The story of “Yedi Belalılar” revolves around a material witness in a murder trial who, intimidated into committing perjury, has doomed an innocent man to the gallows. Days later and miles away, he’s persuaded to return to court and right his wrong. But with the real murderers—bandits—hot on his heels, he asks for protection from a gang of seven good-hearted outlaws—each with a distinctive fighting skill. 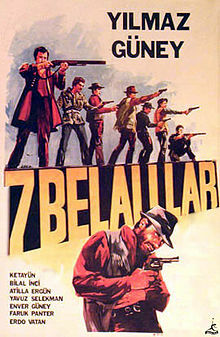 The Seven’s leader, played by Turkish icon Yılmaz Güney, and its champion knife-thrower both have analogues in the Sturges film, but the rest of the team have their own unique quirks and talents. That’s practically traditional; “The Magnificent Seven’s” gunfighters had different characteristics from the Seven Samurai, and each of the Western’s sequels involved a virtually different gang altogether. Beyond its team and core concept, though, Yedi Belalılar has notable differences, for example turning a siege movie into a road trip film as the heroes journey back to the courthouse. In fact, it couldn’t have been an exact remake if it wanted to be. Yedi Belalılar like many B-grade genre flicks in those days, was “made to order” based on the demands of a regional distributor. Such distributors would specify the types of movies they wanted by genre, star, color, and even number of fight scenes, and the production companies would be expected to deliver on time. And in this case “on time” meant almost right away. A distributor from Adana was in need of an adventure film in time for a rapidly-approaching religious festival. So director Irfan Atasoy hurriedly gathered a team and set out to shoot in Asia Minor. But there was a problem: he had no script. And without the time to write one, the cast and crew improvised the entire story as they went along. Working at a frenzied pace, they shot the film in a week and edited it in three days, delivering it in time for the festival. Today, director Irfan Atasoy claims there was no direct connection to “The Magnificent Seven,” but he admits his memory of the film is a little vague. Certainly the story is not identical, nor could it be with so much improvisation. But the parallels are unmistakable. And it’s worth noting that by the time Yedi Belalılar was made there were already three films in the “Seven” franchise. So while it may not be strictly classified as a remake, it would nevertheless feel right at home as an official entry in the series. And besides, this town is plenty big enough for both of them. When another director, Yılmaz Atadeniz, made some of the first Turkish Westerns, his peers objected, protesting “there were never cowboys in Turkey.” But that didn’t bother him. He realized what they didn’t: there weren’t any in Italy either. Thanks so much for watching, and happy trails, pardner. Sonraki İçerik23. Uluslararası Adana Film Festivali Sona Erdi!